We professionally move your piano. Moving families pianos since 1908. Pianos are the music of the home. William C. Huff Companies realize the value of the family piano. Many households have pianos that have been passed down for generations. Others have invested in pianos as pieces of functional art. 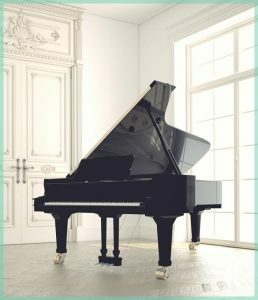 We understand that your piano is irreplaceable, and that is why as a piano moving company only the most senior staff move our clients’ family musical piece. Our senior staff crew leader has an average of more than 10 years of experience with the company and has been involved with the moving and storage of hundreds of pianos in all shapes and sizes. From concert grands to the rare $500,000 Fazioli M, our crews have experienced every possible scenario. Heat, cold and humidity can be disastrous for pianos. At William C. Huff we maintain proper heat, cooling and humidity control to preserve the hundreds of pianos that have been entrusted to our climate controlled storage warehouses. Clients will always know that their pianos are safe and secure with William C. Huff Companies. If disassembly is required, our experienced staff carefully and safely disassemble your piano and meticulously protect all parts during transportation to your new home. Your piano can also be transported to one of our climate controlled facilities and monitored for 24/7 piece of mind. Piano transportation is a delicate performance. The proper equipment must be used to ensure transportation without damage to the instrument. The correct size of piano board is essential for enabling the right protection from door thresholds, steps, and uneven surfaces. Also, the proper size piano dolly is necessary to make sure no damage is done to the floors inside the clients’ home. Once the piano is safely secured in the moving truck know that your piano is riding in a trucks equipped with air-ride suspensions, providing smooth, damage free transportation. Interested in our piano moving services?